You might know her as "The Petite Picasso." But Alexandra Nechita's artistic accomplishments are anything but small, and her style is all her own. 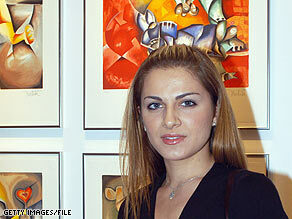 Nechita's family escaped communist Romania for the U.S. when she was 2 years old. At 7, Alexandra was painting with oils and acrylics, and her first exhibit was a solo show at a public library in Los Angeles, California, when she was just 8 years old. Now 22, she attracts crowds worldwide for her exhibitions and brings in thousands, sometimes tens of thousands, of dollars for her paintings. Recently selected by the World Federation of United Nations Associations to lead a Global Arts Initiative, Nechita is expanding her reach to more than 100 countries. With very little formal training, she has more than achieved the financial security her family sought 20 years ago. She knew that her career had passed the point of child prodigy when people looked at her art and said, "That's a Nechita." On a cruise two years ago we purchased two of your drawings that I believe you called "preliminaries." You said that while traveling, you will compose these drawings and often they will be included as part of a larger project. I attended one of your shows and did not see any of these preliminaries for sale. My question is, "Do you plan to include some of them in your future shows?" I am kind of sick of hearing about this young artist with "little formal training". There are many, many young artists out there paying their dues and working hard instead of ripping off Picasso. We are studying in the classical tradition, and studying the masters like Michaelangelo and VelÃ¡squez. We may not get the accolades, but we will have the experience and knowledge that formal training brings. if you have artistic talent in the form of painting and you manage to get recognition then more power to you. The obviously jaded angry artist below who is upset with the recognition given to Alexandra only makes them look bitter and trivial. I love my natural talent and i paint for my own joy and that spills over to others. I'd love to be able to sell my works and live off that income only. But be realistic and realize that luck does play a part in who gets recognized and who doesnt. It has nothing to do with talent. Sure I'd love some recognition and sure there are those putting in their dues, but remember we all have gifts given by our creator and if we use them for selfish gain or do not use them at all, then why have that talent to begin with. Nechita, your as beautiful as your paintings. Eric Gill the typographic artist once said that â€œbeauty is the business of art.â€� We know that their are all kinds of perspectives of art and music. Do you think that art and music could change the world one painting or one song at a time and help us all understand that each of us can be beautiful and do our part to help our brothers and sisters. Especially women or mothers who deserve more respect worldwide? What would that painting look like? Your work is incredibly good. At only 22 years of age, the world is your oyster. The Wine Taster drawing is fabulous. Can your art work be purchased online? Thank you for making such beautiful art for all of us to enjoy. like alexandra, i was also born in Romania and now live in the United States. My question is this: Is she doing anything to benefit the children of Romania? Is she using her fame and money to bring attention to any philanthropic need in her native country? Just because she has no "formal training" doesnt't mean she has no experience. I think a solo show at age 8 says something to that effect. Having had formal training myself, i know that hardly qualifies you as an 'artist'. It just proves how formal training gives anyone who can afford it a pompous attitude about art. Being an artist means combining talent, passion and innovation to create something beautiful. Alexandra appears to have a good grasp on her concept and execution. She really uses wonderful compositions, shapes and colors. And being Picasso-esk doesn't really bother me. He borrowed his styles, just as every artist does. She is another in a long line of natural artists who can achieve worldwide acclaim, and rarely so, in her lifetime. I'd like to know if she's studied the work of Picasso and the other modern artists from the 20th Century and what impact she wants to make with her work in the 21st century. Have you ever feared that you'd wake up one day and not be able to match the quality of your earlier paintings? Anonymous, what are YOU doing to assist the children of Romania? Just because a person has media recognition & money does NOT automatically catapult them into ambassadorship for their native country. Why don't you stop pointing the finger at someone else to take care of an issue, become proactive and start thinking up ways to benefit the children of Romania yourself? You don't have to be famous to be of use to someone. This is an up and coming trend where people expect celebrities or wealthy people to peddle their specific causes and benefits to the rest of the nation. I dislike this trend. It's reflective of people just wanting something done for them, but unwilling to get up and do the work themselves. Despite dogs barking, the caravan passes by (romanian adage). Having genius has nothing to do with formal training. Um, yeah Nechita is beautiful...but can we be honest here? Her work is, at best, decorative. This is what happens when we celebrate artists who, from a young age, emulate what they see and as such are not informed by their own experiences. Art is about filtering experience through form and the articulation of a multitude of responses on a canvas, in a book, on a screen, in a block of clay. This is derivative work that belongs over the sofa, not in a gallery...which certainly has its place, but it isn't worth celebrating any more than the 100's of happy suns on countless PBS mornings when i was a kid. Kudos to you for persuing your innate gift! What training did the classical artists have other than the all the time God put on their hands to sit down, admire and capture their sourroundings with the incentive of recognition and/or a monetary stipend from royalty. Keep following your senses and put women in the map of the Beaux-Arts! I hope that as part of your success you device a way in which your work and talent can be shared with the least fortunate (those who cannot afford museum/gallery visits) and with the youth. You're work is quite impressive and geared towards Mastery. Keep excelling Nechita! Forget formal training or not. Forget shows at 8. Can she draw? Picasso could actually draw. Cubism was a conscious artistic choice on his part, not the play shapes of an 8 year old. He destroyed most of his non-cubist work when his career as a cubist took off. If she actually is a talented artist then go to it. If she's a lucky 8-year old in a 22-year old body then just go. The art world has enough Kinkades as it is. It's true. She is pretty and young and uses flashy colors. But where is the originality? I even checked out some of her work on her website. A painting about hair detangling products? Show us what you have to bring to the table that will shake things up and inspire. She's good, but Picasso was great. He created his own vision and inspired a whole movement. To recycle to a degree is expected, but to paint exactly like Picasso and Marc Chagall is trite. My goodness - there are some serious critics out there. And rude, to say the least! Her pieces are gorgeous. And what does it matter if some of her work is reminiscent of Picasso? All art is reminiscent of something that has inspired the artist. If she is succeeding and inspiring other artists, then congratulations. She is young, talented, and her life story, while not entirely unique, is still an inspiration. It's important to note that she has no formal training because, if you have any experience in the art world and how competitive it can be - to say that someone with such skills as Ms. Nechita who has had no formal training is thrilling. The art community should watch her with wide eyed wonderment as she continues to grow as an artist. And those of you who have no artistic background or skill should stop criticizing just because you don't understand or don't think that abstraction is arty enough. The fact of the matter is - some people get a lucky break. Ms. Nechita obviously has had hers, and we should be appreciating her work instead of insulting it. Formal training is fantastic, but, when someone can come in from the outside and produce outstanding pieces without it, that is cause for accolades, not antogonistic rhetoric from the peanut gallery. Best of luck to Ms. Nechita. "Being that you were a child when you began producing works of art, how do you respond to the removal of artistic classes from elementary schools around the United States in an attempt to make room for more 'real academics'? Why do you feel art is important at a young age?" I don't understand so many people have such negative comments about this story. Why can you not just celebrate this successful young person? Her success does nothing to degrade anyone else. So why do people insist on discrediting her? She paints in a style, cubism. That does not make her any more of a rip off of Picasso than Aaron Copeland is a rip off of Beethoven. Buy her paintings or don't, that is your choice, but why make it your goal to detract from her success. To join the discussion, I am an art historian who has also created art. Nechita is pretty amazing, and not because she appropriates imagery from Picasso or Chagall, but because she started painting like this when she was so young. We are living in such a visual culture so yes, people borrow, sometimes knowingly, other times not. Don't burn this artist for doing something she loves. No one is asking you to celebrate it, but many people do... and that's great. My parents own a few of her works. Honestly, it is a lovely experience to look at them; on one level it feels like a Picasso reincarnate (not so bad...), but they also exude passion. It's palpable. Do people bust on her because they are upset or mad at her style? Or her success? Once she feels she has exhausted this "period" of her work, I hope amazing work will follow. Also, to the person asking "Can she draw" -- it is time to open your senses and not stare down such a narrow scope of what an artist is... I know famous collectors who do require a "study" work before they purchase contemporary artwork, however that is only one approach. Artwork lives on many levels, not just what we study in traditional academia. Thanks for reading - now go look at some art that you find enchanting! I am a war survival and this is an American dream. An incredible story that proves dreams comes true. Her story as an artist speaks to her heritage. I admire this beautiful young woman. Her work is an expression of destine. Thank you Nechita, The higher power have embrace you with a very special gift because of a good cause. I think that most young, gifted people have to face a lot of bitterness and jealousy of those who are not as accomplished. I think that these young, gifted people must work hard to not let this affect them so as to continue to do the wonderful work that they do. They should throw out the negativity and carefully consider some comments as constructive criticisms. She's anything but "pint-size"--if she's making headlines this grand, then perhaps, she will find herself in the art critic's guides 20 years from now. Are most artists considered a master in their own time? Most artists don't achieve much fame without hard work--most don't make much profit. Perhaps they do posthumously. Due to a continual decrease in state spending on public education, many public school districts have created private foundations just to cover their studentsâ€™ basic educational needs. One of the first budget items cut from a U.S. public school districtâ€™s annual budget is art education. As the leader of the Global Arts Initiative, what would you say to convince U.S. politicians and public school administrators to increase spending on art education? I met Ms. Nechita several years ago in Park City, Utah where she was surrounded by snobby people, but she was so genuine and real-- if I had a couple of million I would have bought some of her work! She's incredible. The one issue I see here is that Nechita is consistently referred to as The Petite Picasso or Pint-Sized Picasso. In my opinion, when we use an artist's name as an adjective, that artist's identity and work are devalued. I liken this to the works of Monet or Michaelangelo being used on magnets, handbags, and tshirts. Their entire persona becomes hackneyed. I can't speak for Nechita, but I'm sure she would like to establish her own identity. Alexandra, thank you for expressing your heart to the world. I saw your exibit at the small gallery in NYC, I believe 1996, I I thought to myself , that girl is going to be famous one day. About 10 years later, I am glad I was right. After reading all 23 comments I observed 2 types of comments - those that really appreciate Nechita's work for what it is, whether you call it decorative or whatever, and those angry, bitter artists who've bought into the idea that art still retains the social power it once had in the early 20th century. So my question for Nechita is this, How do you respond to the "fine art" snobs, the those who still believe art is something other than beautiful decoration? You are a creative genius. While the rest were busy doing homework, you were probably painting on your own pieces and holding exhibitions (besides homework)- without a degree. Truely, you have pursued your talent with all your heart. How did you start on your own pieces so early ? What inspired you and kept you going when you started ? Did you practice from any book or any training material before you started making artwork on your own. I am an amateur sketcher. I keep wondering if you kept practicing or self-training for your skills to reach a certain level before you created your exhibition pieces. How do you imagine the forms you paint? Do you have it in your mind before you paint..or do they form on their own on the canvas? Do you have any other hobbies? How do you manage time between school (till now), painting, travel, etc. I know little about you. I am Romanian too and glad you succeed. People does not understand what is in a genius brain. In Einstein was theory that few understand now. Brancusi was shaping space in genial simply forms. In your seems the colors are resonating. I saw one of her shows about 11 years ago (or more) in a gallery in Fort Worth, TX. It was amazing to see the small sketches and the huge completed paintings so up close and personal. I have wondered recently what she is doing now. I hope she still loves what she is doing. Alexandra, I was born in Romania and am so proud to see that finally some our talent is being shown in America. Romania is a country full of talent, and its wonderful that you are being honored for your great work. For those of you who critisize you for not being a philathropist...you don't need to be famous to help. Anyone and everyone who cares about our country should help. We are all proud of you. Didn't ART precede the availability of "formal training"? Certainly many of those we now consider GREAT ARTISTS had no formal training. If formal training in art can instill the bitterness and resentment I'm reading here, who needs it? And who wants to see the "art" borne from it? Young People Who Rock is a weekly interview series focused on people under 30 -- from CEOs to entertainers to athletes to community and political leaders -- who are doing remarkable things. CNN Anchor Nicole Lapin introduces them here, then interviews them Fridays on CNN.com Live. Log on in the 3 p.m. ET hour to catch the interviews. Maybe your neighbor or your friend? Let us know. Got a question for the interview? Fire up your camera and send it in, then look for your video on CNN.com Live. • Know someone who rocks?